Biology, Chemistry and BTEC Applied Science students at The Sixth Form College, Solihull got a taste of what it’s like to be a doctor last week, thanks to a day-long workshop with Operating Theatre Live. Two representatives from Operating Theatre Live came into College to set up a mock operating theatre in the Sports Hall. 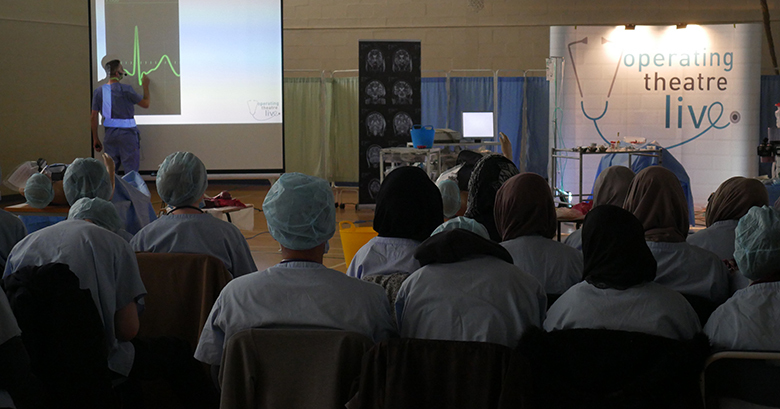 Approximately 50 students took part in the Aspiring Medics Workshop, which included a series of lectures and hands-on practical activities. Some students from Joseph Chamberlain College were also present. The students learnt about human anatomy, patient care, anaesthetics and various systems of the human body including the cardiovascular system, respiratory system, nervous system and digestive system. The students were all dressed in scrubs, surgical hats and masks and each had a stethoscope for the day to really get into the part. Practical activities included dissecting a pig’s brain and eye, inserting a breathing tube into an animal trachea to inflate the lungs and even performing a rudimentary heart transplant using animal organs. A short video of what went on is below. The workshop also highlighted to students the routes open to them if they choose to pursue a career in Medicine, including the number of years training, the Foundation year rotations and the route to eventually becoming a consultant. See more photos from this workshop on our Facebook page.